These fancy, handmade, cane glass beads make me feel happy and young at heart .. brings back memories of days at the carnival. Shades of burgundy and emerald green, wrapped up in argentium wire, with Swarovski crystal accents. 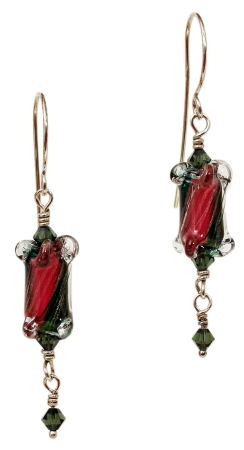 Earrings measure 2¼ inches from top of earwire to bottom of dangle and weigh 0.1 oz each.